It can be so difficult to plan a birthday party for a “tweener”. Not a kid anymore, but not quite a teen either. Especially when said birthday party is one’s first “boy/girl” birthday party. Parties involving manicures, facials and tea parties just aren’t that appealing to the male gender. But candy, hotdogs, nachos, popcorn and movies certainly are! When we decided on our “At The Movies” theme, I headed straight for Pinterest (we’d love you to follow us!) and Etsy to look for some fun ideas! 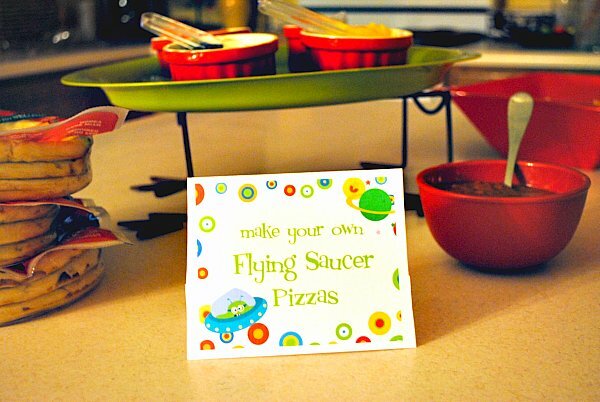 I found Typewink and her adorable Etsy shop, with lots of cute party printables! 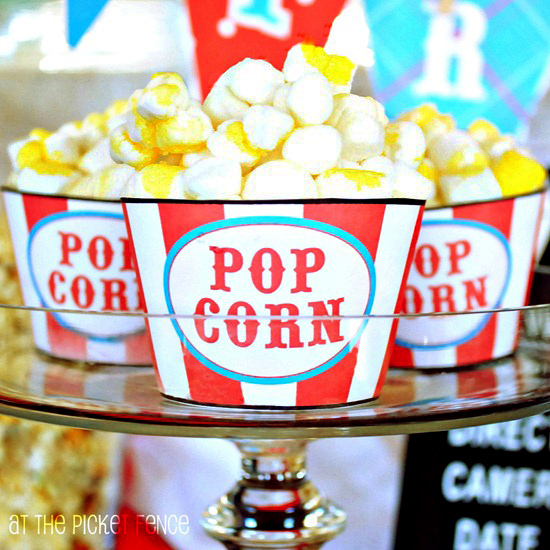 She has an adorable Movie Themed packet, but the girl and I decided we loved the red, black and turquoise theme of her Carnival set and knew we could adapt it to her movie party! 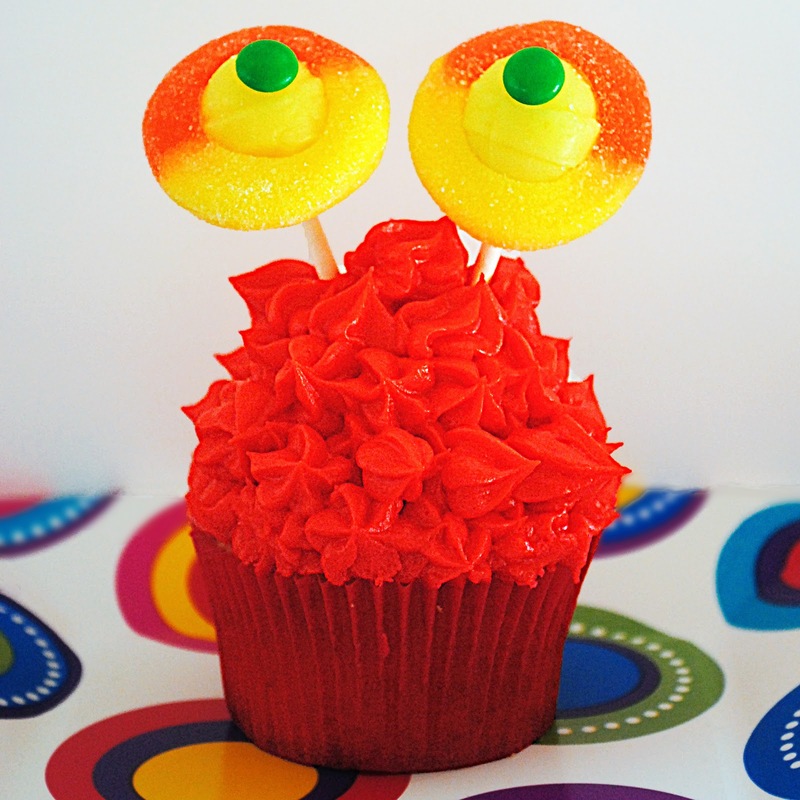 For $10.00 you receive TONS of cute images to print and use for your party. 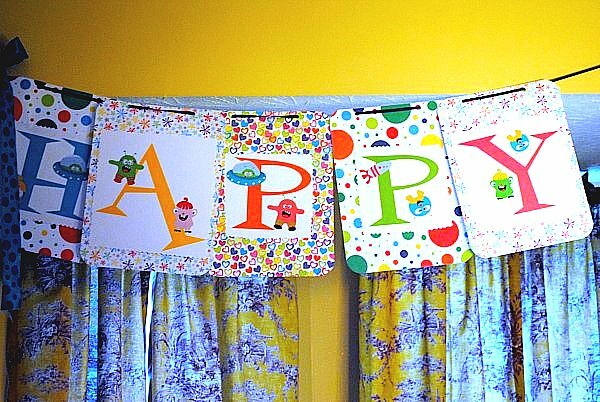 Fun things like the pendants to make a Happy Birthday banner. I hung them on twine with tiny clothespin. So cute! We also printed off these adorable “goodie boxes” and filled them with fun little items, some for the boys and some for the girls. Our favorite items in this packet though, were the “popcorn box” cupcake wrappers! The popcorn box cupcakes were quite the hit! 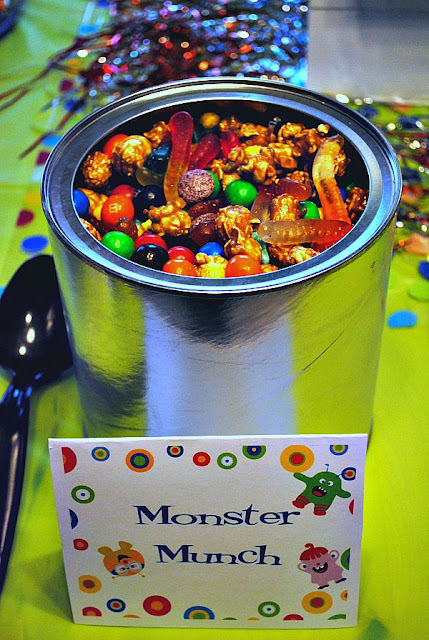 But, I think the Candy and Popcorn Bar might have been the most popular feature of the evening! 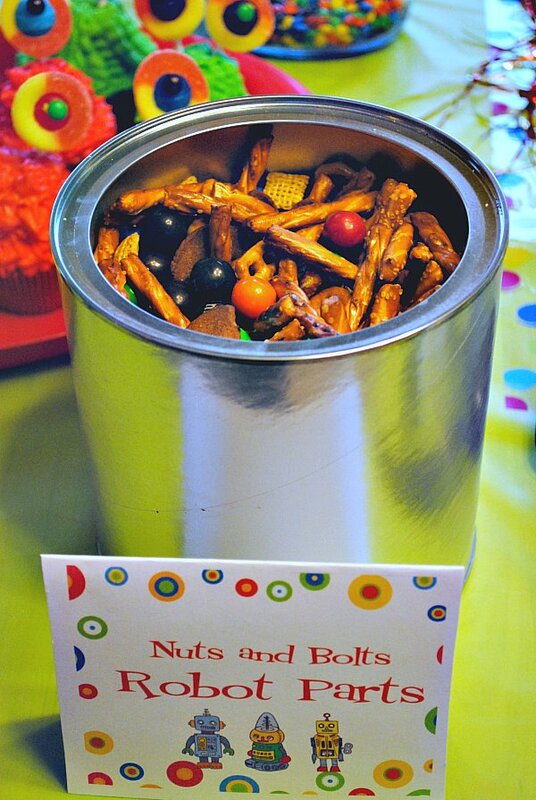 When planning a themed party, the attention is in the details! Little details like wrapping water bottles and the cupcake stand with tickets purchased from the Dollar Tree. 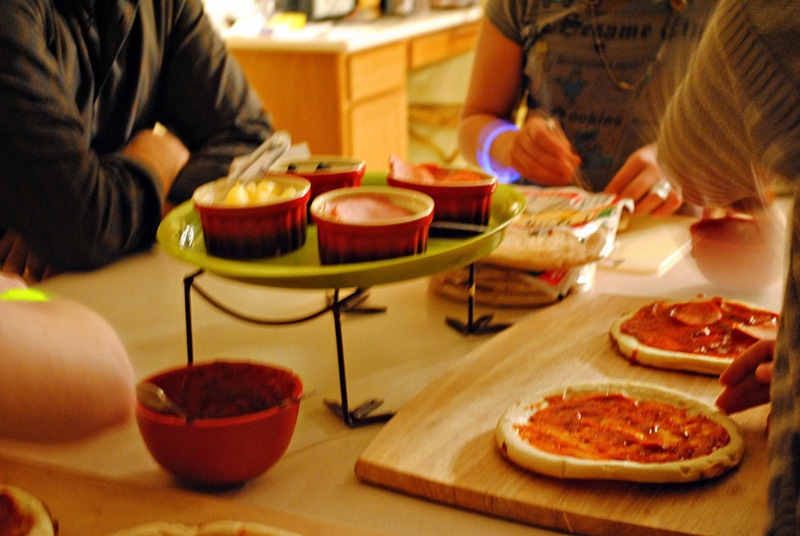 Providing movie food like Nachos, Hotdogs and Pizza Bites. And, including cute movie themed items like movie production clap boards and movie themed napkins. Playing games like “guess my character”. And even turning your TV into a “movie screen”. Then of course, watching a fun movie! Adding details like this aren’t expensive, but really add to overall feeling of the party, helping everyone to get in the party mood! Turn your TV into a movie screen! I added a $2.00 extension rod and a clearance red curtain panel cut in half, tied back with ribbon for a fun movie theater feel! Total cost $4.50! Of course the best part of a party is always fun times with good friends! We so appreciate the great friends our children are blessed to have! Here’s a quick tutorial on making your own Popcorn Box Cupcakes! Bake your favorite cupcake mix (homemade or store bought) according to recipe in cupcake liners, and allow to cool. Frost with your favorite frosting (homemade or store bought). It does not have to be neat because you will be covering it with your “popcorn.” Be generous with the frosting though, so that the popcorn will adhere well to the top of the cupcake. After frosting, place cupcakes in popcorn box cupcake holders. Using a bag of miniature marshmallows, tear or cut marshmallows in half and stick cut sides back together twisting them a little to create the popcorn kernels. 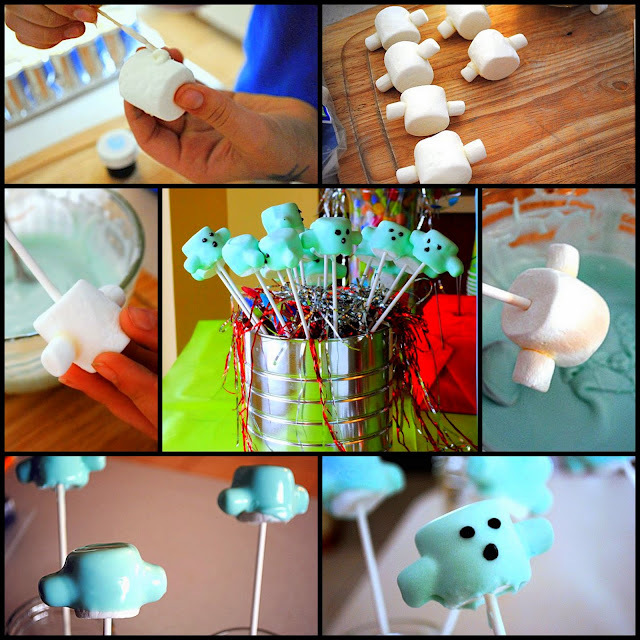 It takes a lot of these so we “cheated” and used regular marshmallows on the bottom and the “kernels” on the top. Wow! Hard to believe a year has gone by and I’m sharing another of the girls birthday parties with you! You might remember her cute Monster, Alien Robot Bash Birthday (yes we can be quite creative in our household. ) from last year! So, a big thanks for sticking around and joining us for another fun party! We also want to give a quick shout out to thank Cassity for featuring Vanessa’s beautiful mudroom makeover today at Remodelaholic! Please pay her a visit over there! And, be sure to join us tomorrow for another party…our one year Blogiversary!! We’ve got some fun stuff in store! Thanks for joining me today…at the movies! Labor Day! The last great hurrah of the summer. One of those days where you plan a cook-out or picnic with friends and family, enjoying the last carefree days of the season before the onslaught of school, football, Thanksgiving, Christmas…all fun but hectic! These types of holidays are always bittersweet for us because while we always try to make them fun, it is a reminder that we don’t have each other close by. We actually enjoy each others company. We think it’s because we are so much alike. We can cook together, decorate together, talk politics and religion without fighting and of course share all of the same memories of growing up…like Heather sitting on Vanessa and holding her down to torture her because she wouldn’t clean the bathroom up after the little girl she was babysitting pooped all over it and Heather had to do it…but we’ll save that story for another day. Ahem..back to Labor Day. In my dream world, I would be celebrating Labor Day with Heather and her family, as well as our wonderful mom and dad. The last time I saw her was over a year ago now, and although blogging together is absolutely amazing, it just doesn’t quite make up for a hug and some good ol’ hanging out! 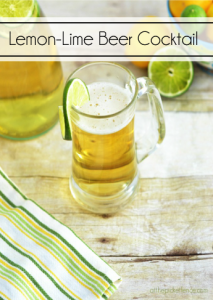 So, I’m pretending that they are on their way over as we speak, and of course, awaiting them upon their arrival would be a tall glass of this “Grown-up” Pink Lemonade. This has been a hit around our house this summer for sure! 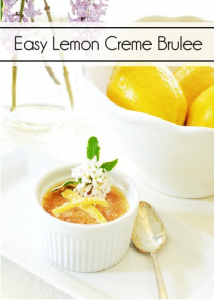 You can guess why this version is for adults only, so click here to get this easy, breezy recipe. Of course, you will need your tummy filled while you sip on this cocktail so I whipped up a batch of these little beauties. These Pizzettes are one of the amazing recipes from the lovely Giada De Laurentis and they are super easy and super yummy! Now we’re heading on over to Heather’s for a picnic and a fabulous Southern dessert! Head on through the picket fence and join Heather at her home in Kentucky! Hi and welcome to the rolling hills of the Bluegrass State. I sure hope you enjoyed the wonderful cocktail and appetizers my sister prepared, I know we did! My sis and family just pulled up in the drive..so follow my niece and nephew to the backyard…I’ve got my extra drink with me, hope you’ve got yours…cause we’re gonna have a picnic! I’ve prepared Grilled Flank Steak and Brie Sandwiches and Rutabaga Fries! Did I lose you at rutabaga?! I hope not because you’re in for a treat. Please don’t fill up too much cause I need you to save room for dessert, which we will enjoy on the front porch..just like a good Southerner. 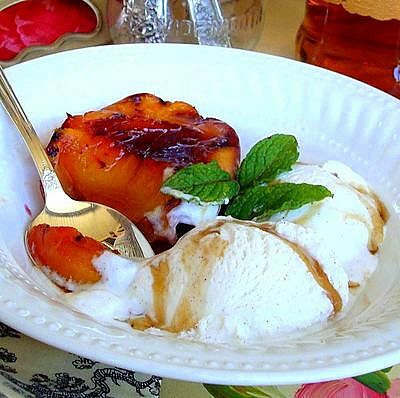 And, what could be more southern then Grilled Mint Julep Peaches with Bourbon Sauce?! and no that spoon is NOT in there because I was sneaking a taste before dinner…in fact I think Vanessa was the one taking a bite…yep it was her…and I’m sticking to that. 1. Preheat grill to 400° to 450° (high) heat. Cut onion into 1/4-inch-thick slices. Brush with 1 Tbsp. olive oil, and sprinkle with 1/4 tsp. salt and 1/4 tsp. pepper. Cut bell peppers into 1-inch-wide strips. Place pepper strips in a large bowl, and drizzle with 1 Tbsp. olive oil. Sprinkle with remaining 1/4 tsp. salt and 1/4 tsp. pepper; toss to coat. 2. Grill onion and bell pepper strips, covered with grill lid, over 400° to 450° (high) heat 7 to 10 minutes on each side or until lightly charred and tender. 3. Brush cut sides of rolls with remaining 2 Tbsp. olive oil, and grill, cut sides down, without grill lid, over 400° to 450° (high) heat 1 to 2 minutes or until lightly browned and toasted. 4. Spread Brie on cut sides of roll bottoms; top with arugula, bell pepper strips, steak, and onion. Spread mayonnaise on cut sides of roll tops. Place roll tops, mayonnaise sides down, on top of onion, pressing lightly. 1. Place first 8 ingredients in a 2-gal. zip-top plastic bag, and squeeze bag to combine. Add steak; seal bag, and chill 30 minutes to 1 hour and 30 minutes. Remove steak from marinade, discarding marinade. 2. Preheat grill to 400° to 450° (high) heat. Grill steak, covered with grill lid, 9 minutes on each side or to desired degree of doneness. Remove from grill; squeeze juice from lemon over steak. Let stand 10 minutes. Cut across the grain into thin slices. Pre-heat oven to 350 degrees. Slice rutabaga in half. You will need a large, sharp knife. Cut each half into 1 inch thick slices. Cut each slice into strips. Remove waxy outer layer off ends of each strip and off the bottom of the end slices. Place strips in a large bowl and toss well with olive oil and next 5 ingredients. Spread fries on a non stick cookie sheet. Place on top rack of oven and bake for approximately 12-15 minutes, turning at least twice. Fries should be golden and crisp. When using brown sugar watch for over browning. If fries start to “burn” turn heat down to 35o and cook a little longer. Preheat grill to high. Pick leaves off mint sprigs. 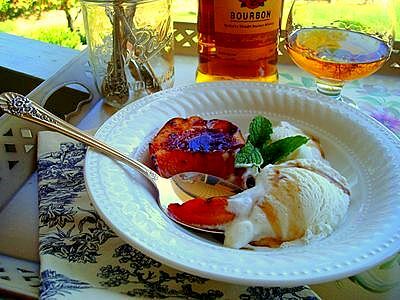 Make the glaze- combine bourbon, brown sugar, & mint stems in a small saucepot over medium heat. Allow sauce to reduce 5 min, remove stems. Half peaches & remove stone, brush with canola oil. Grill peaches, flesh side down and covered, for 2 minutes. Rotate 180 degrees and grill, covered, about 2 more minutes- depending on how ripe the peaches are. Plate peaches, flesh side up, and drizzle with glaze. Top with ice cream and garnish with mint leaves. We hope you enjoyed joining us for our Virtual Labor Day Party! Now is where we start hinting that it’s time to wrap the evening up..that is so you all will leave and we can have one last glass of wine together, just the two of us, sitting on my front porch enjoying each other’s company. Thank you for spending Labor Day with us…At The Picket Fence! Now, I have to be honest here. After years of “Boy” parties, having the chance to buy flowers and pretty paper plates that don’t have Lightsabers on them was a dream come true. 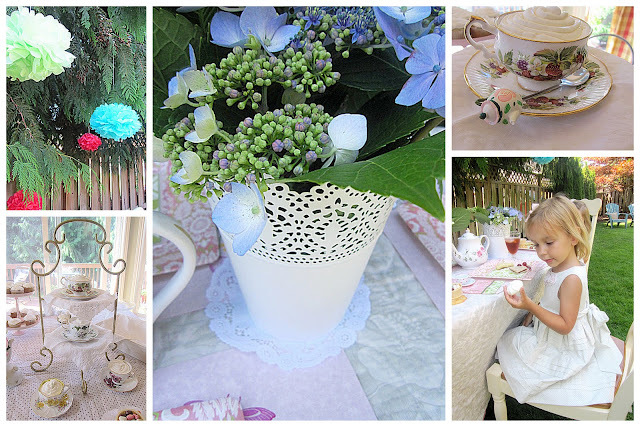 Don’t get me wrong, those boy parties can be pretty exciting too, but there is just nothing like little girls in darling dresses sipping tea from tiny teacups and giggling away! We welcomed our guests this year, as we did the previous one, with the age of the Birthday girl outlined in roses and hanging on the front door. I will share how I did this, along with some other tutorials, next time! I used a quilt my grandmother made for me when I graduated from High School as a tablecloth and it was the perfect backdrop for all of the goodies. 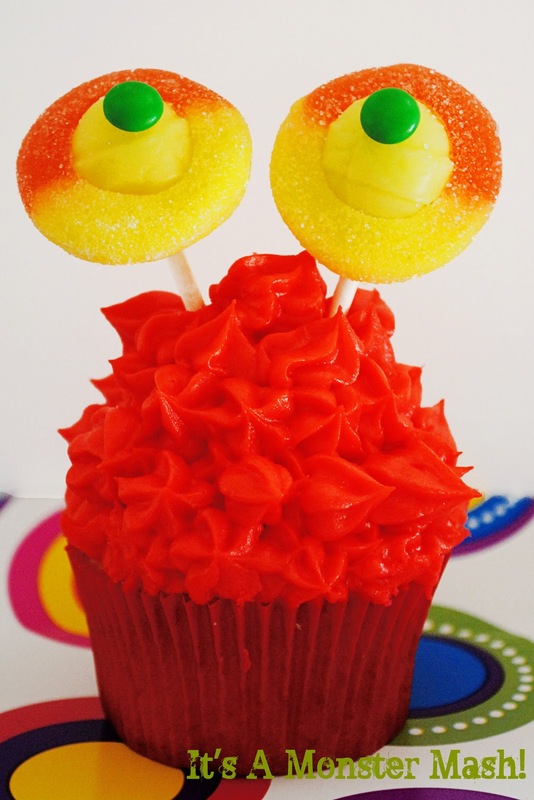 …filled with a cupcake and covered in frosting! Doesn’t it look like whipped cream? My mother-in-law loaned me the darling little teapot spoons. A simple arrangement of a teapot filled with flowers. These edible teacups were without a doubt the hit of the day! Auntie Heather spotted them on the Disney Family website and of course I had to try my hand at making them myself. The girls thought it was so fun to be actually “eating” their teacups! The beverage cart out on the deck was dressed up with my silver tea set and a homemade doily banner. This was about the easiest thing to possibly make. Just simply fold a paper doily over your string and staple or glue in place! And, what could that be off in the distance? Why, it seems to be the perfect spot for a spot of tea! The tissue pom-poms were on Clearance at JoAnn’s and created a fairy-like effect for the girls as they sat under the branches having their tea. I think the Birthday girl approved of all of this, don’t you? Another quilt (this one a wedding gift) became a tablecloth, and then the layering of their tea table began. I found these darling paper plates and napkins at Tuesday Morning last year on Clearance (of course!) and saved them knowing there would be the perfect occasion for them. They are sitting on top of these beautiful paper placemats that my grandmother gave me years ago. Lauren was very curious about the Meringues and wasn’t sure she actually wanted to eat them. She quickly realized just how sweet they were though and was found later sneaking around the table eating up all of the leftover ones! And, we couldn’t send our guests home empty-handed now, could we? Each girl received her very own oversized Tea Bag filled with goodies. These were so easy to make even though the moms “got it” more than the girls did! Simply load a white paper bag with your party favors, fold the corners in then fold the top down and staple. A piece of twine with a tag and the guests name attached completes the Tea Bag! All in all, I think we can call this Tea Party Birthday a success! It was a bash! It was a monster, alien, robot bash! 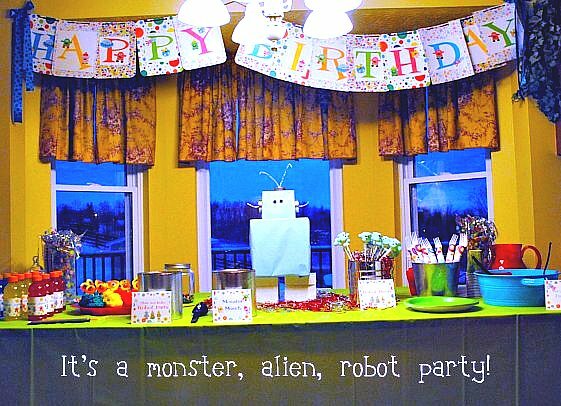 Monster, Alien, Robot Birthday Party!? cute monsters, aliens and robots! Of course no such party supplies exist…trust me I know. do not doubt me. just believe. 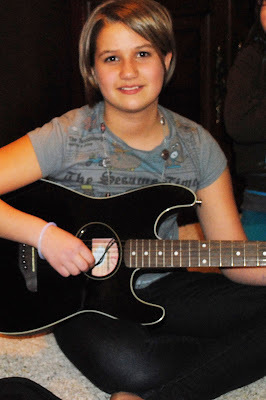 See, she was turning 11. and she didn’t ask for a Hannah Montana party, or a Hello Kitty party, or a “horse themed” party, or a “cool rocker chick” party..she asked for a Monster, Alien, Robot Party. And in all honesty, that will probably never, ever happen again. I had to take advantage of one more year. One more year of fun coming before cool. One more year of creative versus chic’ and trendy. I knew I was going to have to come up with my own design. I was able to download an adorable set of png. graphics from mygrafico.com, it’s kind of like an Etsy shop for graphics. The set I purchased was $4.00 and I was able to do so much with them! I combined the alien monster graphics with a robot graphic I had through photoshop and was able to create a custom design incorporating all of the elements she had asked for. 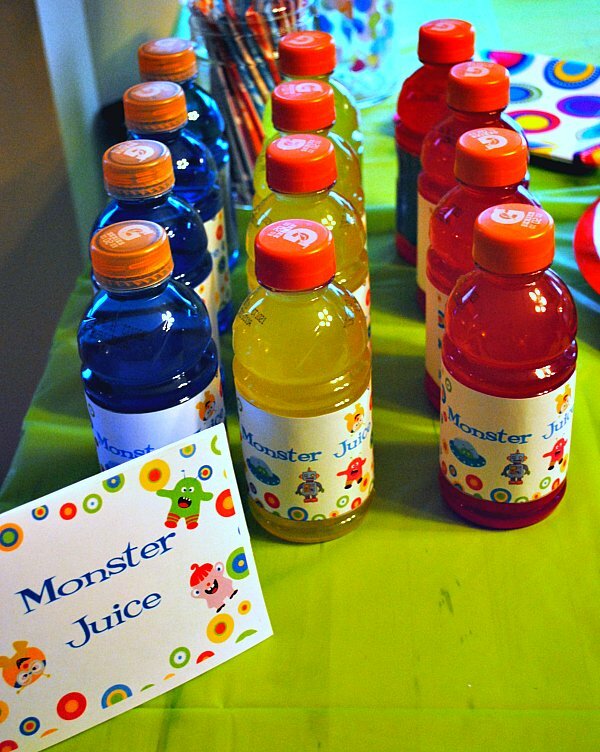 On card stock we printed off the letters to Happy Birthday and added monsters, aliens and robots to each one. We then cute them out and place each letter on coordinating scrapbook paper. We strung the letters along ribbon and tied each end with matching bows! 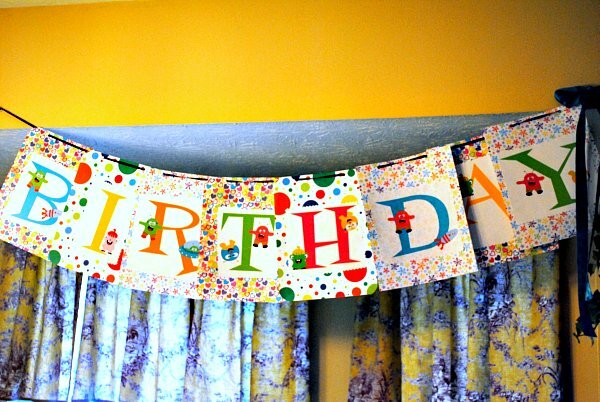 It was a super easy and inexpensive way to make a custom birthday banner! 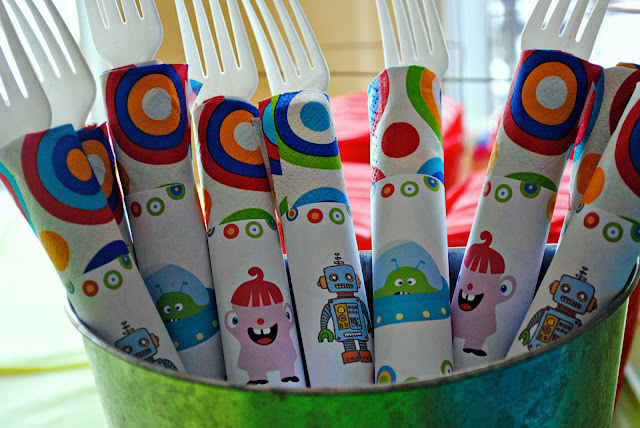 I also made napkin rings each with either a monster, alien or robot on them! The girl’s had fun picking which one they thought was cutest. 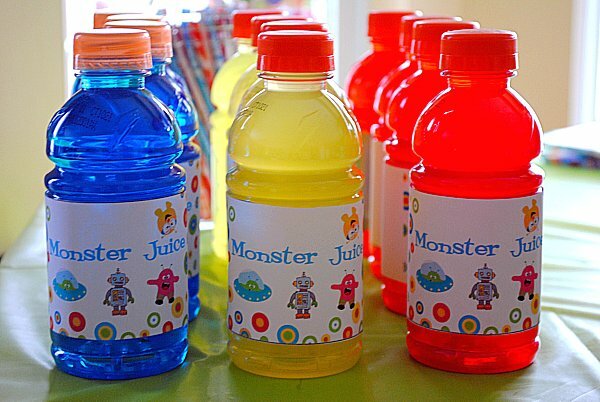 We had Monster Juice of course! I replaced the Gatorade labels with custom ones made from printable sticker sheets. if they preferred they could have some Monster Munch! Alien Cereal (Kroger Brand) thrown in for good measure! 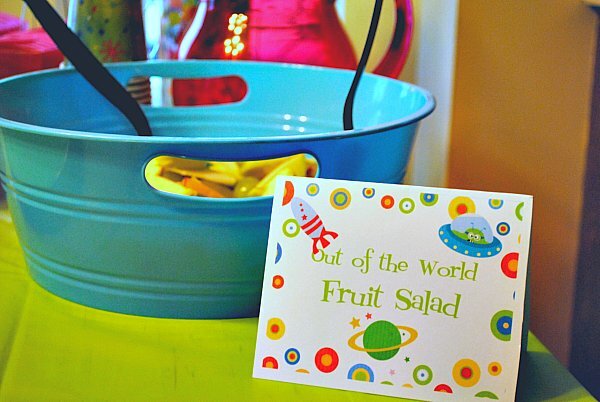 we decided some “out of the world” fruit salad would fit the bill! This included quarter moon “apple slices”, monster eyeballs “grapes”, blackberries “alien brains” and of course….star fruit! For dessert we came up with an original creation just for the party! These were so much fun to make but required a little bit of effort. 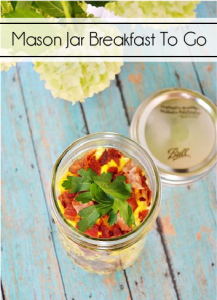 I would suggest making these early in the day or the night before. They looked so adorable placed in another reused coffee can. Gave them that industrial robot feel! where I have put them in printable form for you! These were a real hit with the girls and so yummy! Monster Cupcakes from Annie’s Eats! Oh my goodness, I love these little guys! Remember the little alien monsters from Sesame Street? These remind me of them! A few had one eye, most had two but ALL of them were too cute! I seriously had to force people to eat them cause they were just too adorable! They were also beyond easy to make. 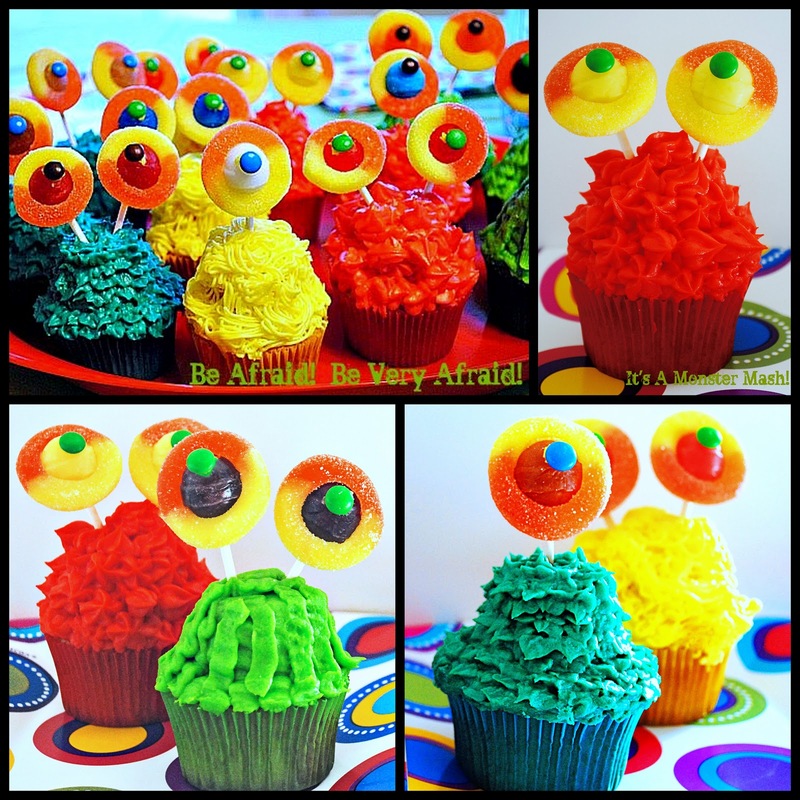 Visit Annie’s Eat’s to get the tutorial on these lil’ monsters! 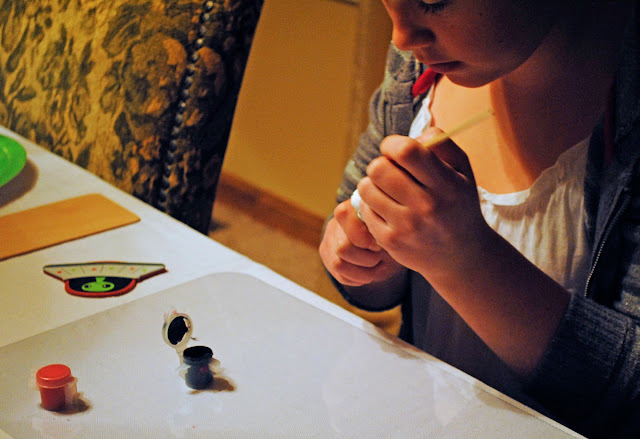 After eating the girls moved on to crafts. 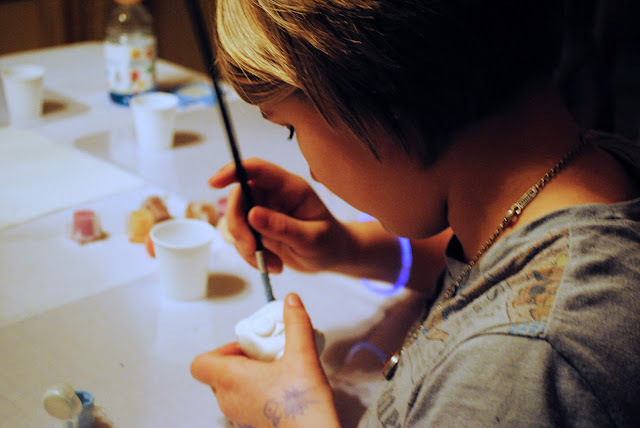 Where they were able to paint their own “cute monster”. I was able to find these at Hobby Lobby. They then painted custom door hangers for their room and could choose from either a monster, alien or robot wooden cut out to put on the hanger. To round out the evening we watched what else but…Monsters Inc. and Monsters vs. Aliens. a guitar. Which is one of the many reason why I love her so much! She’s one pretty awesome, cool kid! Thanks for celebrating my daughter’s birthday with us…at the fence!